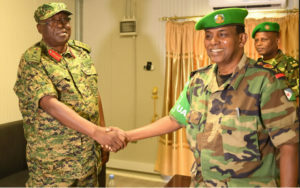 Lt Gen. Jim Owoyesigire (left) assumes office as Commander of AMISOM from Lt. Gen. Osman Noor Soubagleh. Photo by Agencies. UPDF General Lt Gen. Jim Besigye Owoyesigire on Wednesday took over as new Force Commander of the African Union Mission in Somalia (AMISOM). In an announcement made by the African Union-AU mission, Lt Gen. Owoyesigire replaces Lt. Gen. Osman Noor Soubagleh, who has been in office since July 2016. The UPDF General pledged to continue with the work already started, especially with capacity building of the Somali National Army (SNA) and enhancing security across the Horn of Africa nation. “All of us here have one problem and that is Al-Shabaab. We need to fight him, break his backbone and then finally eradicate him. That’s my goal and I will achieve it,” Lt. Gen. Owoyesigire was quoted in a Somali newspaper. The new commander’s urgencies shall, therefore, include overseeing a unified, gradual and conditions-based transition and transfer of the security responsibility from AMISOM, to the Somali security forces, and destroying the remaining pockets of the Al-Qaida affiliated Al-Shabaab militants. Lt.Gen. Owoyesigire who has served for 39-year in the UPDF promised to bring vast knowledge to AMISOM Force in Field Artillery and Air Defence, basing on his experience gained while serving Commander and Division Commander – Field Artillery Division, among other capacities in Ugandan Force. ” I have never withdrawn from the battlefield for the last 39 years and I like training; which I am going to do with the Somali National Army, operate with them and when times comes, for the transition to handover the power, I will do that,” he said. Lt Gen. Owoyesigire holds two masters degrees, one in defense and strategic studies and the other in religion, peace and conflict resolution.